interested in the news itself. alive. There were threats of Bus Bombs ,Suicide attacks et al. Remember,We also lost nearly 100,000/- lives. we were always wrong in the eyes of the Western World. But all I can do is ask , Where were you When We needed you ? I am sorry for all the innocent lives lost in the Terror attack in Paris. But I truly cannot feel shocked or devastated. I’ve been numbed ! Who ever who put this on Lanka web Thanks. French Government openly supported the Tamil Terrorists and BBS. Then Accused MR for supporting BBS. Why did BBS go to France then to Norway? Put a last minute subversive effort with the Election Commissioner to stop the MILITARY Advance. MUSLIM OBAMA then decided to put a MUSLIM Atul Ketchup as the US ambassador to open up house mosques. This has been very successful up to now. French Presidents, future, Present and past all gave kick to Muslim Obama’s teeth TODAY! Now Muslim OBAMA only country you can control is Sri Lanka. Now Muslim Obama, your support Article writers and comment writers like fran Diaz, have to put their tails between legs and hide. Lorenzo, where are you? Still supporting this illegal entity. Why cannot youth and ordinary workers come to the streets and get this Ranil (in Singapore for brain tumor treatment) punk CBK Srisena and the Election commissioner be pulled out to the streets? ?Ooops, Forgot the Ladies Dress designer Mangala Samaraweeraya! He has a heart condition. JUST LOK AT THE BRITISHER LOSING HIS PATIENCE, AMONGST OTHERS. 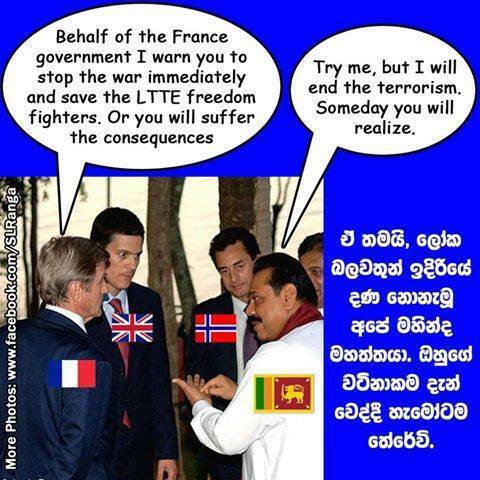 NONE OF THOSE BUGGERS COULD MATCH MAHINDA. NONE OF THEM HAD THE INTELLIGENCE OF Mahinda Rajapakse and his team TO SEE THE STUPIDITY OF WHAT TOLERANCE OF SUICIDE TERROR COULD LEAD TO. EVEN TODAY, THEY WILL SUPPORT THE CURRENT YAHAPALANAS TO HOUND HIM. All you state is absolutely true. Your ideas are incontestable. Your feelings are genuine. I think of a theme dear to our gentle commentator Fran Dias…the theme of the Tamil caste system and the Dalits. For the International Community which is a camouflaged appellation for the USA and the West European powers, the whole world is divided on the Tamil caste lines. Their so called abolition of slavery was just hypocrisy and deception. Slavery was re-introduced through their eye-washing system of ‘indentured labour’ which made slavery contractual. They continue to rule the world on the basis of a re-painted caste system of which WE, the third world are the low caste: the DALITS. We are scapegoats and experimental stuff, in other words ‘human guinea pigs’ for their political laboratories. All the evils that befall us they repaint and make to look different. When terror strikes us, they moralize issues and depict us as the party at fault. The terrorists (rather ‘insurgents’, ‘freedom fighters’) have, they say, valid reasons. They are fighting for a genuine cause. They turn us into acceptable cannon-fodder for ‘justifiable’ terrorist attacks. But how is it when they are at the receiving end? Then terrorism becomes transformed into an act of lèse-majesté. That means an affront to royalty. they are the truly sovereign ones, the kingly race. A terror act becomes an ‘act of war’ which deserves a ‘merciless’ (impitoyable) response. Then they call on all the ‘forces of democracy’ to go to war with them. They turn the world into a battled field. Yesterday Francois Hollande addressed the entire parliamentary system of France at Versailles and said precisely that. The measures he wants introduced are ‘draconian’. They will put our anti-terrorism effort and measures to shame. Our much decried PTA will look childish. He is mobilizing the whole of France to fight the terrorists. He also mentioned a clause of the European Union which says when one country of the Western alliance is attacked, the entire alliance is bound to enter into the fray. He is calling for massive conscription to the security forces at all levels. He has put the whole of France on a war footing. His speech was reminiscent of that of George Bush after the 11/9 twin tower attack. They unilaterally divide the world into the ‘good’ and the ‘evil’ forces. The speech of Hollande ended with the entire assembly singing their national anthem the ‘Marseillaise’ which is a blood curdling call to murderl and bloodshed. It wants the enemy blood to saturate French soil. That they have transformed the world into a killing field saturating it with the blood is of no concern to them. That is “truly worthy and just” as the liturgical phrase goes: vere dignum et justum est. They are the kingly, priestly, divine race issued from the ‘head of Manu’. The ones destined for annihilation are the DALITS, the untouchables, the cannon fodder.